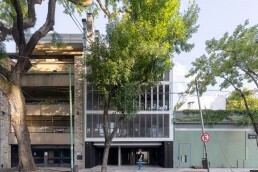 Edificio de viviendas JN2678 (Ciudad de Buenos Aires, Argentina) por Estudio Cubero Rubio. 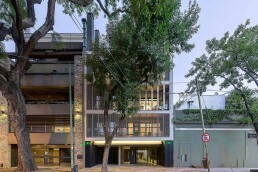 El proyecto del edificio de viviendas Jorge Newbery 2678 surge a partir de la conformación de 2 volúmenes edilicios de 4 niveles cada uno, implantados al frente y contrafrente del terreno. Los mismos alojan un total de 12 unidades de vivienda de 1, 2, y 3 ambientes, repartidos en 6 unidades cada uno, siendo coronando el volumen principal, ubicado al frente con una terraza verde de uso común a todas las unidades del edificio. Las unidades del conjunto son sintéticas, depuradas y de características contemporáneas, en donde algunas poseen el valor propio del balcón-terraza como elemento de expansión directa hacia el espacio urbano, mientras que otras lo hacen a través de expansiones aterrazadas conforme el edificio se retira para adecuarse a los límites fijados por la normativa. Hacia la fachada principal del conjunto, las expansiones de las unidades se contienen tras un compleja trama constituida por celosías metálicas orientables que determinan, no sólo una característica formal y visual particular, sino también una herramienta eficaz para el control de la incidencia del intenso sol del noroeste, a la vez que determinan un necesario filtro material para la relación de la expansión interior al complejo espacio urbano. The Jorge Newbery 2678 apartment building project results from two volumes of four levels each placed in front and the back of the lot. 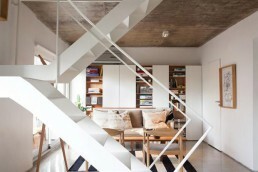 Twelve apartments take place in those two volumes, with units of 1, 2, and 3 rooms that are divided into 6 units each. The main volume, placed in the front of the lot it’s crowned with a green terrace of common use to all the building. 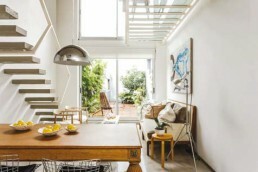 These volumes are linked to each other through a system of walkways that determine an inner-outer circulation connected to a large virtual center that satisfies the needs of lighting next to a visual integration of nature and the built urban environment, redefining the way of living the contemporary housing of medium density. The apartments are synthetic, refined and contemporary, some of them have a balcony-terrace as the element of direct extension towards the urban space, while others have terraces witch are conformed as the building withdraws in order to adequate to the construction code. 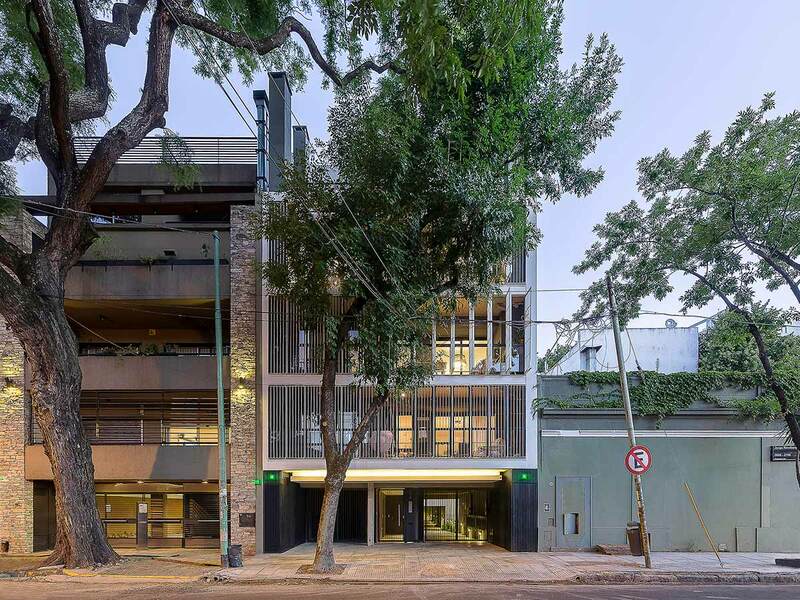 The materials that conform the building are the result of a research based on the elements with which our city is composed; reinforced concrete, bricks and steel. Faithful materials that together give durability and validity. 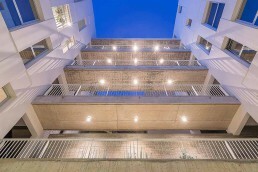 Towards the main façade, the balconies are contained into a frame of a mobile metallic lattice that not only acts like an esthetic characteristic of the building, but also it is an efficient tool to shade the intense incidence of the north-west sun, as well as it conforms a needed limit between the balcony and the complex urban space. The building suggest the subtle condition of anonymity, meanwhile seek to reconfigure, from its material and programmatic sincerity, the already accepted characteristics of the contemporary human habitation.